A successful hedge fund database is supported by three key components and Hedge Fund Research (HFR) has been able to excel at all three. These include underlying fund data provision, indices and research. HFR sees each of these product sets as part of a larger, homogenous language for tracking and analysing hedge fund performance. HFR’s core database product tracks over 7,000 hedge funds and funds of funds, while its indices provide a series of critical benchmarks, including on a strategy-by-strategy basis. It has a regular output of industry reports that draw on its rich data, including analysis of particular regions, fees, leverage and customised feedback for clients. The entire product suite never stands still; HFR is particularly cognisant of the fact that the industry it covers is always changing, and it must do the same to remain competitive. “The landscape is shifting constantly, but we are able to consistently convey what the underlying realities of the industry are,” says HFR President Kenneth Heinz. The different groups that come together to comprise the underlying constituents of the industry all understand and use HFR’s strategy classifications, data products, indices and analysis to remain informed about what is going on. Founded in 1993, HFR is considered the leading hedge fund data provider by many investors for a number of reasons, one of which is the fact that it has been tracking fund performance for two decades. In addition to offering the most broad, robust and seasoned coverage of both well established and emerging hedge funds today, HFR also offers an extensive historical archive, or ‘graveyard’, of data from funds that have since ceased operation, all of which can be invaluable for research, due diligence and backtesting analyses. “While [20 years] doesn’t seem like an eternity when you talk about mutual funds with 30 or 40 years of track record, it is a very long time in the life-cycle of the hedge fund industry,” says Heinz. Partly thanks to its lengthy track record, HFR is now recognised globally as a premier provider of global hedge industry data, with a physical presence on the ground in North America,Europe and Asia. “That franchise and brand awareness that we have built up is important, because it tells the story of how the industry has evolved and grown up over time,” Heinz explains. From the very beginning, HFR has enjoyed a deep relationship with the fund managers, large banks and allocators that it serves. This has allowed HFR to understand the industry and what drives it at a deeper and more nuanced level. Relationships and good communication are part and parcel of this. It informs HFR’s research and output, helping the company to understand what differentiates a particular strategy. This might seem very subtle to the casual observer, but hedge fund managers, who are passionate about what makes their strategy work, value a database provider with the highly evolved taxonomy to be able to accurately reflect such differences. It is a taxonomy that is widely used across the industry, including by service providers, and as a common framework for discussion. It allows a data point that was produced 20 years ago to still have relevance today, and provide a more informed comparison across market cycles. Users can analyse data that is based on the same deep relationships with the managers across two decades. “In terms of the codified taxonomy of hedge fund strategies, others have tried to copy what we do, but our clients, partners and constituents understand that we were the originators of that hierarchy and structure, and that’s what makes it powerful & invaluable,” says Heinz. 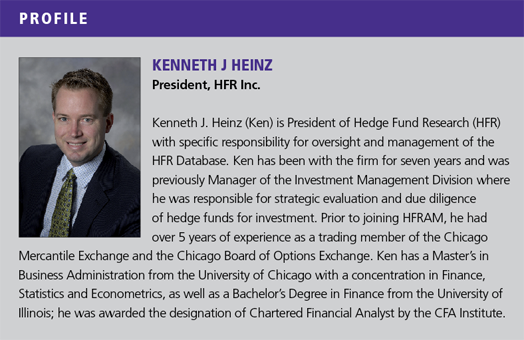 Throughout the volatile years of 2007-2012 HFR has been a steady and accurate barometer, acquiring a widely accepted role as “the official scorekeeper of the hedge funds industry.” Through the performance volatility and capital redemptions of the financial crisis, HFR maintained its data capture and solidified its reputation and integrity. Since then, as new trends have emerged, like that for liquidity or the resistance to future lock-up arrangements, or the advent of UCITS, HFR has been steadily adding to the data facilities that investors are asking for. These important areas of strategic development will not be the same things that define the industry in the future, and new trends will emerge to shape the hedge funds business, but Heinz and his team are ready to capture these when they present themselves. With the advent of more institutional allocators to single-manager strategies since 2008 and the creation of de facto fund of funds businesses within pension plans, the material difference in requirements for data and research on hedge funds has not changed. However, HFR is now seeing an institutional demand for additional information – for example for passive, investable index-linked products. It represents a shift from the typical allocation that had a discretionary component to it, to one that has institutional underpinnings of required return and accounting assumptions that impact many more people than those involved in the investment decision. With the increased emphasis on transparency and governance, there is still not a highly evolved sense of the hedge fund industry amongst some institutional allocators like that which the private wealth managers of the 1990s might have had. There is consequently a need to communicate data and information about hedge funds to individuals that are not as familiar with the way the alternative investment industry functions. HFR is finding that it is playing a much more active role in this educational process for its institutional clients. HFR’s credibility and its unbiased role are critical components of its overall success. HFR has been engaged frequently in the past by global financial institutions for dedicated consulting projects. Its affiliated company, HFR Asset Management, carries out an extensive amount of due diligence on managers. But beyond the additional services, it is the quality of the data and robustness of the research and indices that its clients appreciate. Reliable hedge fund data is still harder to come by than one might think. Sit down with any one of a number of institutional investors, and you will invariably hear complaints about how some databases are prone to errors, partly because of misreporting or erratic reporting by managers, partly because human error can creep in as a result of the highly manual processes that are still at work in the back rooms. Consequently, any measure of a hedge fund database will need to take into account the clarity and accuracy of the data. This is, after all, the core product for any provider. While data from a live exchange will be informed by price, data reported by third parties requires a degree of additional attention. The regularity of UCITS data has helped to supply more accurate and consistent data sets, and this is one of the unsung benefits of the UCITS model for investors, but in terms of the bigger picture, because HFR’s data product is so widely used, the reporting of the results by funds on its database has become almost analogous to a monthly earnings release. In 2008, when the HFRI Fund Weighted Composite Index (HFRI) was down 19%, HFR started to release performance deciles for the entire universe of funds comprising the HFRI. The worst decile of the component 2000 funds returned an average decline of 62.4% for the year, demonstrating that even funds which had performed poorly throughout the financial crisis continued to actively report their performance to HFR. The evolution and expansion of transparency had transformed the whole culture of performance reporting for the hedge funds industry since the beginning of the last decade. Investors are familiar with the strategic focus, performance dynamics and volatility of a fund, and can chose to invest or not based on these, but it is important to maintain an active continuous profile to develop this type of awareness, familiarity and credibility. Technology continues to drive efficiency in the database industry. HFR has a major emphasis on technology R&D; its online analytics and reporting engine is in its third generation. Some of its archive formats remain in older formats purely because this is what its clients still require. Still, Heinz is optimistic that technology will continue to make investors’ lives easier, enabling them to make more informed decisions about how they want to allocate their capital, with more information concisely summarised in an efficient way. Innovation includes using social media to enhance overall HFR reporting, particularly in new markets like Asia, where HFR has been expanding its franchise visibility. Chicago-based HFR Group, founded in 1993, is market leader in the provision of industry data, performance measurement, indexation, research and asset management services on the global hedge fund industry. The HFR Database is based on over 11,000 funds tracked historically (data available back to 1990) and is considered to be the definitive source of hedge fund performance and information. HFR also distributes the HFRI Monthly Performance Indices – the premiere benchmarks for the hedge fund industry.